We are asked by the United States to believe that the murder by the US Airforce of 80 soldiers in the Syrian Arab Army (the army of the elected Syrian government) was simply a 'mistake'. It seems more likely that the US is trying every trick in the book to stuff up all attempts at peace in the region. Is their ultimate aim is to wipe the Middle East clean of any organised peoples, stuff up Russia (using NATO/EU which they are desperately trying to prop up) and take over the petroleum assets? Whilst the US is an uninvited and illegal presence in Syria (whereas Russia is invited) it is also, with cooperation from the Saudis, keeping the price of oil down (by flooding the market with short-term fracking products) to assist promotion of instability in the oil-dependent states in the Middle East and South America/Central America, which the US hopes also to take over. The only hope here is for a Trump win because Hillary will only keep all this going, whereas he has made noises about keeping the US nose out of other peoples' business. As to whether all the American troops and commanders and allies in the Middle East and Syria are in on this, it is possible that they are not, as the following article from RT suggests, which makes the whole thing even more shocking. 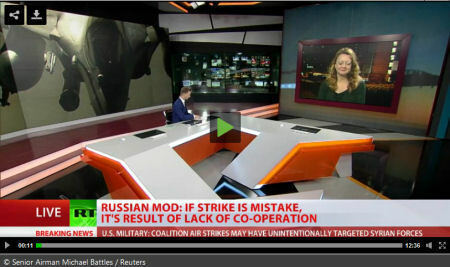 The following videoed interview and article were published as breaking news on RT news on 17 September at https://www.rt.com/op-edge/359690-us-syria-airstrike-unlikely-unintentional/. The US must cooperate with Russia on intelligence matters in Syria, former MI5 agent Annie Machon told RT, expressing doubt over Washington’s explanation for the “unintentional” raid which killed over 60 Syrian soldiers on ISIS’ frontline. “Russia has better human intelligence on the ground because it is cooperating, it is working with the Syrian authorities. So they have access to proper human intelligence, which is much better than the Americans tend to use, which is satellite surveillance and electronic surveillance,” Machon said. Cooperation with Russians is “vital” in Syria because of the ever-changing battlefield situation on the ground, which US forces cannot grasp from the air, as they are not working with the government in Damascus. Without this cooperation, Machon fears, the ceasefire achieved by both sides on Monday could falter without securing its main objective. Commenting on the actual US strikes which killed at least 62 Syrian soldiers and wounded around 100 others near the eastern city of Deir ez-Zor, on the front line of the struggle against Islamic State (IS, formerly ISIS/ISIL), Machon hinted that Washington’s decision to attack Syrian forces was likely premeditated. The former MI5 agent pointed out that Russian role in Syria is clear while the US policymakers are “divided” over their objectives in Syria. Machon recalled a PBS interview last month during which former CIA deputy director Michael Morell who told host Charlie Rose that Damascus – as well as Iran and Russia – should “pay a big price” in term of casualties in Syria. Ahead of the US presidential election, Machon wondered if Saturday’s strikes stemmed from Morell’s views, who is a strong supporter of Hillary Clinton. Another interpretation of the reasons behind the US strikes on Syrian army positions, Machon believes, could be to “reassure the so-called moderates,” who are funded and trained by the US, that Washington still supports them. “So if indeed this was a planned air strike and it was indeed there to reassure the so-called moderate groups, that would make sense,” she explained. If that is the case, Machon says that “Americans are dealing with fire” because the so-called moderate rebels often defect to Jihadist groups along with the military hardware provided by the US to fight against American forces and interests on the ground. Still anybody out there in doubt of the nefarious US-Nato plans in Syria & their links to the ISIS?? US Fighter Jets attacked Syrian Army units near the airport and killed 62 soldiers and injured 100. Deir Ezzor is a known ISIS stronghold and the US cannot make any excuses of "intelligence failure", as they always resort to - which by the way is an insult to "our intelligence"
Yet the Syrian Army has fast recovered from the attack & recovered territory, even as Syrian Govt has condemned the US aggression which essentially is defending the terrorists like ISIS, Jbahat Fatah al Shams (Syrian Al Qaeda, previously Jabhat al Nusra) and the Ahrar al Shams. Putin has stated that the Militants and Terrorists are only taking advantage of the Russia-US brokered truce to regroup and rearm and that the US will be to blame for the failure. The US agenda has shifted from "Regime Change-Assad Must Go" to the balkanisation of Syria, starting with a Kurdish Statelet in the North and then a Salafist-Wahhabi statelet/s with the pockets that they still control, with the US-Nato forces providing the aircover. This plan is doomed to fail, even as the Syrian Army and their Russian allies in combination with the Hezbollah, Iran and China continue to gain ground against the Islamists Jihadists terrorists. That did not last for too long though even as the Syrian Army quickly regained lost ground and had the ISIS on the run.